Please note: This slideshow is best viewed from a computer. If viewing on a mobile device, please download the Bangladesh Photovoice - Chakaria Booklet to ensure that you are able to view the captions on the photos. During the monsoon season, the Matamuhuri river gets severely inundated. To reach the community clinic, people living on the other side of the river have to cross the river with boats, which can be difficult for certain groups of people and thus limits accessibility to the facility. This community clinic is situated on a busy road where there is a lot of traffic. Even though community clinics primarily provide maternal and child health services, the location of this facility makes it risky for women with small children to visit. The security of our community clinic was always a concern amongst beneficiaries and providers. We are happy now that after implementation of the community scorecard, through collective action of the clinic committees and local government, a boundary wall was built around the premises. The Community Clinic Citizen Charter is hung up on the wall of the facility. This is very helpful for beneficiaries as it informs them about their rights regarding getting services from the clinic. The Community Healthcare Provider has hung up the list of drugs available at the community clinic, and she updates it regularly to indicate if she runs out of supply. Being able to see this list helps us to know about the availability of drugs at the facility. The community is very happy that the community clinic takes the initiative to provide education on health and wellbeing to the people. It is good that the community clinic offers Expanded Programme on Immunization (EPI) for children through monthly sessions at the clinic premises. Now, people do not have to travel all the way to the Upazila Health Complex to avail this service that benefits the children so much. Adolescent vaccination is very important. It is nice to see that community clinics are raising awareness and offering these vaccines at their facilities and that the adolescent girls are availing this service. This tube well is the only source of water at the Shaharbil community clinic. However, it is out of order and it is not being fixed. So there is no direct safe water supply at the clinic, causing inconvenience to both beneficiaries and providers. The only lavatory in the community clinic is in bad condition, even though the appointed community clinic personnel try to keep it clean. This causes inconvenience for the clinic staff and visiting beneficiaries. 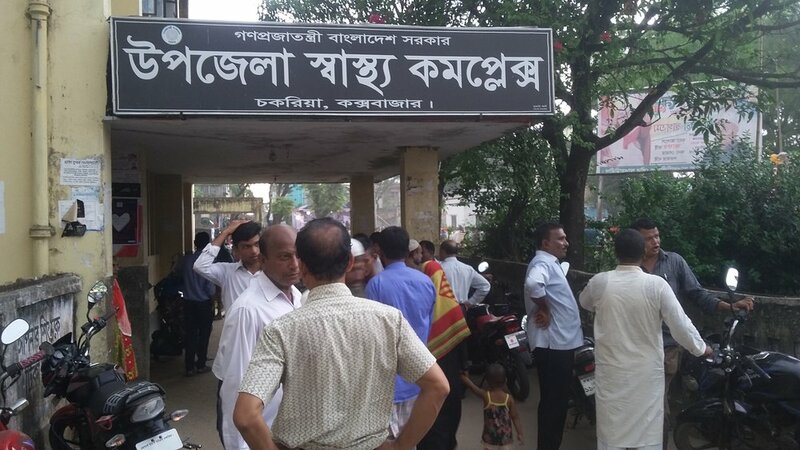 While it is helpful that the community clinics provide referral to the Upazila Health Complex (UHC), the linkage system is not smooth. Patients still have to go through middlemen/brokers at the UHC, which is an added hassle. Tobacco cultivation is common in Chakaria and there are plantations right next to the community clinic, which is very harmful for the people and the environment. The fumes from tobacco burning is also detrimental to the health of people, especially for pregnant women and children. The community would greatly benefit if the community clinic takes up the initiative to raise awareness about the harmful effects of tobacco farming and tobacco use.